As fans are all too aware, the BBC – with a painful lack of foresight – wiped their original master tapes of almost 100 episodes of classic Doctor Who. Over the years fan recordings of video and audio have allowed these lost stories to be restored and live on either as audio books (with linking narrations) or remastered home video releases of various serials, some of which have been completed using animated versions of missing episodes. Arriving in time for the 50th anniversary of its original (and only) television broadcast, The Power of the Daleks is brought to life thanks to a combination of the remastered audio track with animation and for die-hard fans of classic Who it’s quite a treat. The story is iconic for various reasons, most significantly that it introduces the Second Doctor and that it pits him against his greatest foe – the Daleks. Troughton’s performance as the ‘renewed’ (the term regeneration would not be established until Jon Pertwee’s tenure as the Third Doctor) version of the Doctor is sublime as he effortlessly switches between mumbling eccentricity, sparks of intellectualism and sporadic instances of the downright barmy – all to the befuddlement and even frustration of companions Ben (Michael Craze) and Polly (Anneke Wills). There’s a real sense of growth in characterisation across the serial’s six episodes, with Troughton establishing a satisfying rhythm as the Doctor settles into his new form and likewise, Ben and Polly start to become familiar with and trusting of their new – yet old – friend. Beyond characterisation, writers David Whitaker and Dennis Spooner craft an atmospheric and, in later instalments, reasonably tense tale as the Daleks utilise deceit, masquerading as ‘servants’ to exploit the scientists and bureaucrats of Vulcan to their own devious ends. This is certainly one of the great Dalek stories and a strong Doctor Who adventure overall. 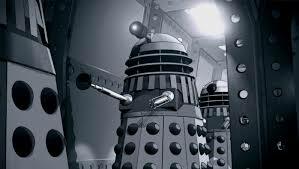 In terms of the animation itself, it’s fairly limited (and if you own DVDs of The Tenth Planet, The Moonbase or The Invasion then you’ll know what to expect) yet this often works in the favour of The Power of the Daleks providing it with a level of old school charm that evokes the period from which it originates and the blending of CGI with traditional hand drawn cell animation gives the Daleks themselves a slick range of motion that actually eliminates some of the clunkiness that the manually operated live action studio models would tend to produce. Fans of modern Doctor Who will find The Power of the Daleks to be a strange and markedly different experience and it’s drawn out pace and moments of inaction will likely be testing. Admittedly, like a lot of classic Who serials the story could have been tightened to four episodes but it’s an ultimately gripping and enjoyable journey thanks to some great acting from Troughton and the building of tension and excitement as the Daleks’ latest plan for conquest gradually unfolds. On the DVD: Various special features are included, comprising episode commentaries, a making of documentary, animation and photo gallery, PDF extras, surviving footage reel, telesnap reconstruction and more. The bottom line: One of the most iconic classic Doctor Who stories is lovingly restored thanks to a wonderfully kitsch presentation combining audio with animation. Although modern viewers will struggle with its slow pace, every fan should check out The Power of the Daleks. The Power of the Daleks is available on DVD in the UK now. The serial is also being broadcast by BBC Worldwide. “The Power of the Daleks” : a lost classic ‘Doctor Who’ story now restored by the BBC via a combiation of animation and original audio.